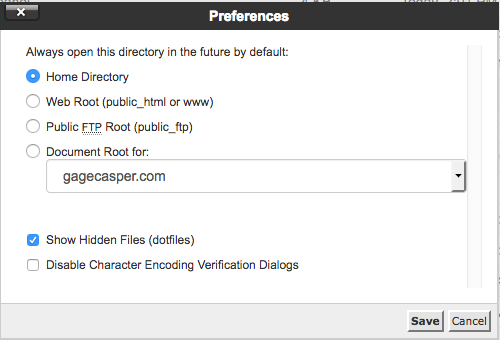 Force Redirect Your .htaccess File to https – Paul Casper – Creator. Educator. Leader. Even though we get a free SSL Certificate with our hosting package (The thing that tells web browsers the site is safe to visit), we have to make sure our web server is configured to utilize it. We do this in a hidden file on our web server called .htaccess. By default, the .htaccess file is hidden on your web server. We need to adjust the settings to be able to see hidden files. Launch the File Manager in the Files area. In the upper-right hand corner, click on the Settings button. Now you can see all kinds of new files in your file manager. I am extra careful, so usually move my original .htaccess file to a new folder so I can re-upload it in case something goes wrong. Once you save your new .htaccess file, you need to upload it back to the public_html folder on your server. In your public_html folder, you will now see 2 htaccess files; one with a dot (original), and one without (new). With any luck, you will be able to go to any non-cms site within your hosting account and the browsers will be redirected to https, ensuring browsers see your site as secure. If for some reason this doesn’t work for you, explore the links provided above at inmotionhosting.com and see what you can do.